Honda CB400F. The coolest 4/1 pipe ever installed on a stock bike. OMG, If I had the money, I would have that Whitehouse CB750/1100 in my garage right now! I have been wanting a CB1100 since they came out anyway! Right now I have a 1995 CB750 (Nighthawk) with a cafe fairing, Corbin seat, and a Vance and Hines 4-1. I would love to replace it with a CB1100 with Staintune exhaust. Give it a look/listen on YouTube. P.S. I forgot to mention that in my opinion, the CB1100/Staintune is how a bike SHOULD sound from the factory!!! Kurt that a sweet custom! Maybe you should feature it and check the reaction. I’m sure it will get many 5 star votes. There’s pics in a google search showing it in various colors. Red just happens to be my fav. CB1100’s seem to be selling well. By the way Steve, right-you-are about the pipe. It was not just the 400f that had that pipe. I had a 1976 550f that had the same pipe on it. It was one of my favorite bikes! Beautiful burgundy paint with the gold super sport stripes on it. 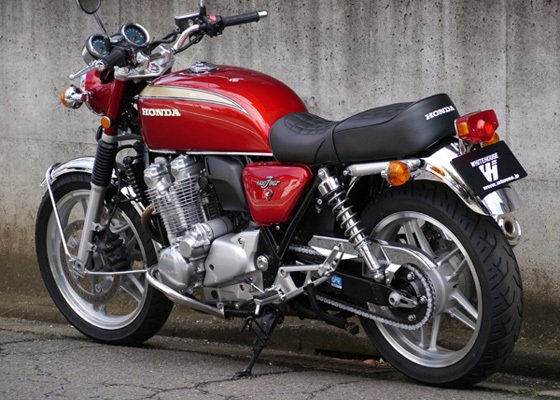 I have a CB400F, exactly like the one shown, in my garage. Only it hasn’t run in years. Seeing the one on your Web page made me feel really guilty about not giving it the love that it deserves. Even as a non-runner, it beautifies my entire garage!